Eli is done. I mean, he's been done for years. Just reiterating. After a two-game losing streak in which the Philadelphia Eagles played some pretty uninspiring football, they went up to North Jersey and stomped all over the hapless New York Giants, 34-13. During the Eagles' two-game skid, one of the bright spots was the play of Wentz, who is proving each and every week that he is very much still a fantastic quarterback. Against the Giants, Wentz probably had his best game of the season, going 26 of 36 for 278 yards, 3 TD, 0 INT, 1 sack, and a passer rating of 122.2. There should be no concern about Wentz. He can still play at a very high level, but can his teammates consistently perform on a weekly basis? Coming into Thursday night, the Eagles had won 16 of the last 20 matchups against the Giants. Make it 17 of 21. The Giants' offensive line is horrendous, Eli Manning is done (this has been true for years now), the defense is bad, and the star wide receiver is a train wreck. This was the 173rd game between the Eagles and Giants. The Giants have always owned the head-to-head advantage in this matchup since Game 1, and it has mostly been lopsided. It is now 86-85-2, Giants. The Eagles can tie it up Week 12 at Lincoln Financial Field. Against the Eagles, with time left on the clock before the end of the first half, Beckham decided he had seen enough, and headed to the locker room a little early. After halftime ended, Beckham was late getting back out onto the field for the start of the third quarter. On the one hand, his quarterback stinks, as does his team in general. On the other hand, that was clearly evident when he signed a five-year, $90 million contract extension less than two months ago. 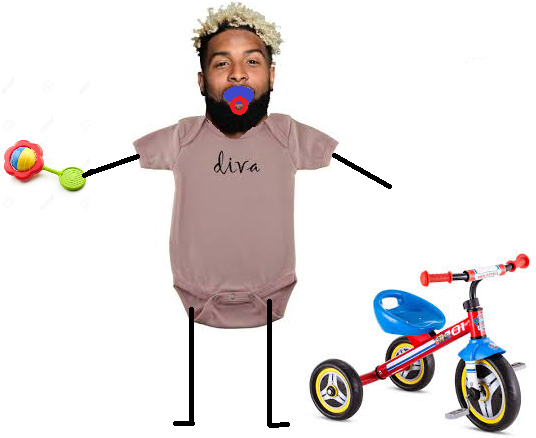 It's not getting better anytime soon, Odell. Last Sunday, I had a debate with another reporter on what teams in the NFL had the worst long-term outlook. The only team that I could come up with worse than the Giants was the Oakland Raiders. Johnson labored through a painful ankle injury Thursday night, and while he understandably gave up some pressure, his willingness to play through pain in a must-win game has to be admired. Peters is going to waltz into the Hall of Fame whenever he retires, but it feels pretty clear that this is going to be his last season in the NFL, if that wasn't already obvious. Peters had a rough night, both in terms of performance, and the fact that he had to leave the game with a biceps injury. According to Derrick Gunn of NBC Philly, "it’s the kind he can still play with." Yikes. In addition to Peters and Johnson, the Eagles also suffered what could be another time-costing injury, this time to slot corner Sidney Jones, who left with a hamstring injury, and did not return. The Eagles' injury woes continue. Last season, Jeffery missed a big chunk of camp as well as the preseason, and he started the season slowly. Eventually, he gained rapport with Wentz, and began putting up nice numbers. In 2018, there has been no such rapport issues. In three games since returning from his shoulder surgery, Jeffery has 18 catches for 218 yards, and 3 TDs. He is a legitimate No. 1 receiver, and the offense is notably better with him playing. Were the Giants dumb for selecting a running back at No. 2 overall in the 2018 NFL Draft instead of taking one of the many talented quarterbacks available? Is that running back really freaking good. Well, he better be, but yes, he is. 13 carries, 130 yards, 1 TD. 9 catches, 99 yards. There goes the Eagles No. 1 ranked run D.
Personally, I did not think the Eagles' pass rush has been bad at all this season. They have consistently generated pressure all season long, but have been let down on the back end by some very bad play from the Eagles' secondary. Thursday night, the pass rush was utterly dominant, albeit against a really bad Giants offensive line. They had 4 sacks, which doesn't really tell the story, as Eli Manning was picking himself up off the turf all night. It's been a while, but the Eagles' pass defense was good against the Giants, despite what Manning's 281 passing yards might indicate. The Eagles were especially good at getting hands on the ball, and breaking up passes. On the game, the Eagles had nine pass breakups, with Ronald Darby leading the team with four. 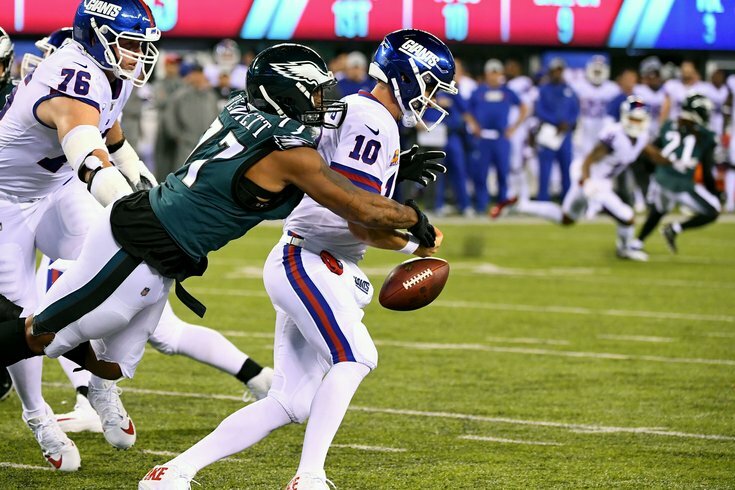 Jordan Hicks' pass breakup led to a Kamu Grugier-Hill interception on the Giants' first drive, which eventually led to an Eagles touchdown, setting the tone for a comfortable win. The Eagles technically lead the NFC East standings, at least until Sunday, on the strength of a divisional win that the Washington team doesn't have. The Giants are done and the Cowboys are garbage. Wentz aside, the best thing the Eagles have going for them is playing in a horrendous division.